Owning a good-quality cookware set that improves your convenience in the kitchen can be beneficial. It helps you prepare finger-licking meals easily and enables you to learn and try out new recipes without too much hassle. The ideal cookware set should be durable, versatile, easy to use & clean, and with low investment value. Getting the ideal set, however, can be difficult because of the influx of substandard products in the market. If you are looking for complete cookware set with the ideal features that will revolutionize your kitchen experience, this product is for you. In this article, I will show you one of the best cookware sets in the market right now including its features, pros, cons, and final verdict. The Blue Diamond 14pc Cookware-Set is a nonstick set that entered the market as a toxin-free option. While the name sounds high-end and exclusive, the set is as affordable as it is good-looking. You get a top-quality cookware set that offers optimal levels of durability, versatility, usability, and quality without stretching your wallet. What is unique about this set and what sets it apart from other brands on the market? Is it as good in terms of quality as the manufacturers imply? Let us have a look at the features that the Blue Diamond Pan 14pc Cookware-Set comes with, and what to expect once you purchase one. 1. High-quality Construction. The Blue Diamond 14-piece set comes with top-quality stainless steel construction that offers you high levels of durability and convenience. You get a non-toxic, non-stick set without Lead, Cadmium PFAS, or PFOA, that does not release toxic fumes even when overheated accidentally. Every single piece in the set is built to serve you for a long time while offering high comfort levels when cooking. The cookware comes with diamond coating, which makes it up to 5 times more durable than most other options out there. The nonstick diamond coating also makes it 4 times better in heat retention and transfer, which improves your convenience and saves you time in the kitchen. 2. Complete set with 14 essential kitchen utensils. The Cookware Set comes with 14 essential kitchenware. Each individual piece comes with high-quality construction for longevity and easy cleaning. The versatility of your set provides you with a piece designed for particular meals, which revolutionizes your experience in the kitchen. Every cooking piece comes with ceramic coating for easy release of food and cleaning. The diamond coating on the saucepans and pots make them excellent heat conductors and retainers for fast, convenient cooking. 3. Compact and Lightweight Construction. The stainless steel construction of the Blue Diamond is lightweight and compact to offer high levels of comfort in the kitchen. The entire set weighs 16 pounds with each piece designed to be light and sturdy. Despite the ceramic and diamond infusion and coating, the set remains lightweight compared to other copper-infused sets on the market. You get a set that allows you to serve and move with large amounts of food with ease. 4. Warp Control Base. This cookware set features a forged base that is extremely light to guarantee you extreme strength and sturdiness. You will never experience any warping, degrading or wobbling when preparing and mixing ingredients for your meals. As a chef, loose and wobbly kitchenware is not only stressing, it affects your convenience and puts you at risk of injury in the kitchen. Unlike other options out there, the cookware set does not wobble after long-term use thanks to the sturdy control base construction and design. 5. Improved Usability. The Blue Diamond 14-piece Cookware Set is designed to offer optimal levels of usability making it an ideal set for both professional and amateur chefs. You get a set that is compatible with different stovetops including electric, gas, and halogen. Although it is not suitable for induction stovetops, your set is broiler and oven safe for temperatures up to 850f. Owning a cookware set with improved usability features helps you prepare meals fast & easy while guaranteeing your safety and convenience when cooking. 6. Easy Cleaning. Nothing disorients in the kitchen like dirty dishes that are also difficult to clean. To address this, Blue Diamond designed and constructed a cookware set with ceramic coating to make cleaning easy. Each individual piece is dishwasher safe and extremely easy to clean with little amounts of soap or detergents. 7. Nontoxic Construction for Healthy Cooking. Unlike traditional cookware that came with metal-only construction, the Blue Diamond set comes with toxic-free stainless steel construction. 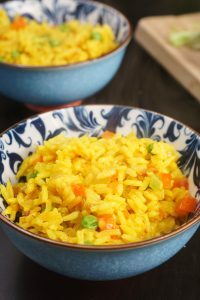 Over time, research showed that cookware constructed with some metals like aluminum and lead pose various health risks https://www.amymyersmd.com/2014/01/healthy-cookware-shopping-guide/. This prompted manufacturers to construct kitchenware with non-toxic material for safe, healthy cooking. This particular set is Perfluorooctanoic acid (PFOA) free, Perfluorooctanesulfonic acid (PFAS) free and does not contain any lead or cadmium. You get an ideal toxic-free set that allows you to prepare healthy meals for your family or customers. 8. Safety Features. Safety is crucial in the kitchen but getting a cookware set with ideal safety features can be difficult. The Blue Diamond 14-piece cookware set comes with various safety features including insulated handles to keep your hands safe. You get a set with fitting lids that keep you safe when cooking and ergonomic handle design for safe handling. 9. Modern Attractive Design. This set features an eye-catching, attractive design and outlook that will stand out on your kitchen cabinet. You get a cookware set available in different colors including blue, black and silver. The Blue Diamond 14-piece Cookware Set is unarguably one of the best-looking sets I have seen on the market right now. You now know the various features to expect from the Blue Diamond 14-piece Cookware Set. Now, with all this information. Is this set really worth the hype? To understand this, let’s have a look at the various pros and cons of this set. Ultra-durable set with a layer of diamond infused ceramic coating. You get a cookware set with high levels of durability and top-quality construction for long-term use. Features 14 individual essential kitchen utensils. The set comes with 14 individual kitchen utensils to improve convenience in the kitchen. You get a set with high-quality pieces including 2 skillets, 2 saucepans, 1 stockpot, 1 steamer, 4 glass lids, and 3 extra cooking utensils. Super Non-Stick coating. The cookware comes with a nonstick coating to prevent your food from sticking when cooking. This helps you prepare delicious meals easily with increased convenience. Forged base. This set is designed with a forged base for extreme sturdiness, strength and warp prevention. The set’s pieces dont loosen, wobble and warp during the cooking process. Toxin-free set. You get a cookware without PFOA, Lead or Cadmium for healthy cooking. 5X harder than traditional non-stick pans. The set is designed to last 5X more compared to other traditional sets out there. 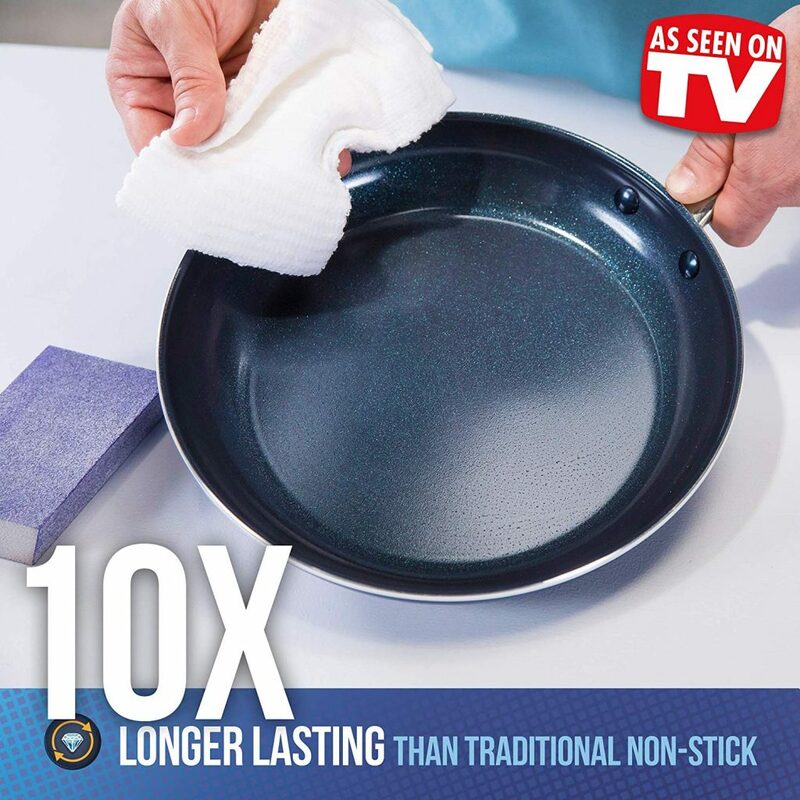 A coating that lasts 10X longer compared to traditional non-stick pans and other sets available in the market. 4X faster and even heat conduction and transfer. This set is diamond-infused which makes it the ideal set for heat conduction and transfer. This helps you prepare your meals faster and keeps your meals warm after cooking. Increased usability. You can use your cookware set with various stovetops like halogen, electric and gas. Broiler and oven safe. The set can be used in broilers and ovens for temperatures up to 850F. Metal and dishwasher safe. This set is extremely simple when it comes to cleaning and dishwasher safe. Low investment value. This is a premium-quality cookware set with high levels of affordability. This set offers numerous kitchen utensils without overstretching your wallet. Develops scratches and bruises. The set’s nonstick coating is not as strong as advertised by the manufacturer. According to various customer reviews, the set develops scratches and bruises after long periods of use. Handwashing recommended. Although the set is dishwasher safe, hand washing is recommended for a prolonged lifespan. You are also advised to use wooden or nylon cooking tools to prevent scratches. Hot handles. The set comes with numerous safety features including insulated handles. The handles are, however, stainless steel and can get hot during a long cooking process. Requires lubricants. According to customer reviews, the nonstick coating is not as perfect as advertised. Food still sticks if you do not use oil or butter when cooking. So, is the this Cookware Set really worth the hype? The Blue Diamond 14-piece Cookware Set is a good-quality set that comes with an array of features designed to revolutionize your experience in the kitchen. You get a set that is extremely durable and high-quality stainless steel construction for long-term use. The diamond infusion and ceramic coating helps in heat retention and transfer, which makes it an ideal cookware set for fast meal preparation. You get a versatile set with 14 pieces that are essential for an improved kitchen experience. A few customer reviews show that some of the features of the Blue Diamond Nonstick Cookware Set remain wanting. Many customers dislike the stainless steel handles because they get hot when placed over heat for a long time. The nonstick feature may not be as effective as advertised, which requires you to use oil or butter. Although it is dishwasher safe, the cookware set is better washed using hands for prolonged life. Whether you are a chef or a passionate home cook, the Blue Diamond 14-piece Cookware Set is a product you might want to consider. Despite the few shortcomings, the features, pros, and benefits of this set are overwhelming. You get a high-quality cookware set that is durable, versatile, easy to use, and clean with decent amounts of safety capability features. If you are looking for a cookware set that will help you revolutionize your kitchen experience at an affordable price, this is a set you might want to consider.